For a few days before Domi (my daughter) and Duncan (her husband) emigrated to Canada they stayed in our garden cottage. Duncan pointed out that he prefers a bar of soap in a soap dish rather than liquid hand soap. He also knew that I love a new pottery challenge. 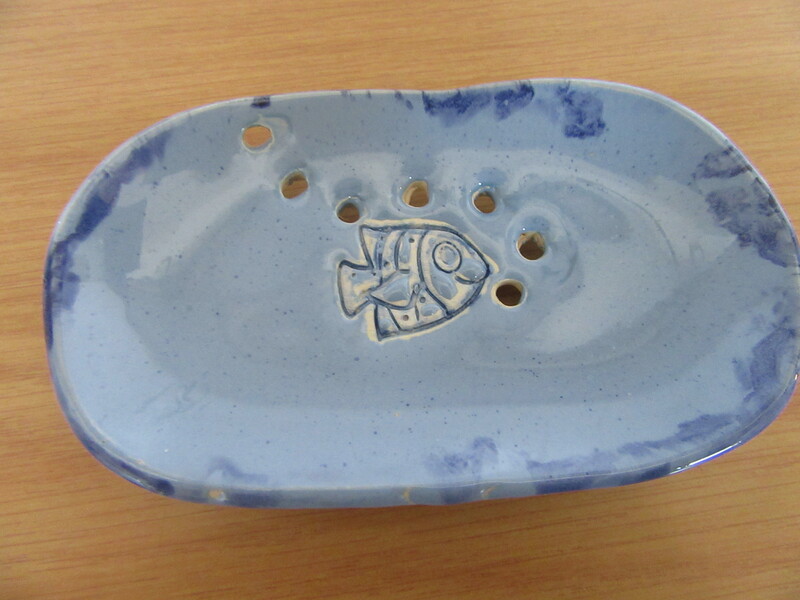 I have now made a few soap dishes in 2 different styles. The important thing is that the soap must not lie in a pool of water. 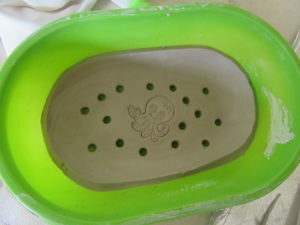 The first way is to stand the dish on small feet and have holes in the soap dish so that liquid can drain, the other is to have a raised portion in the centre so that the soap rests above where any water may pool. 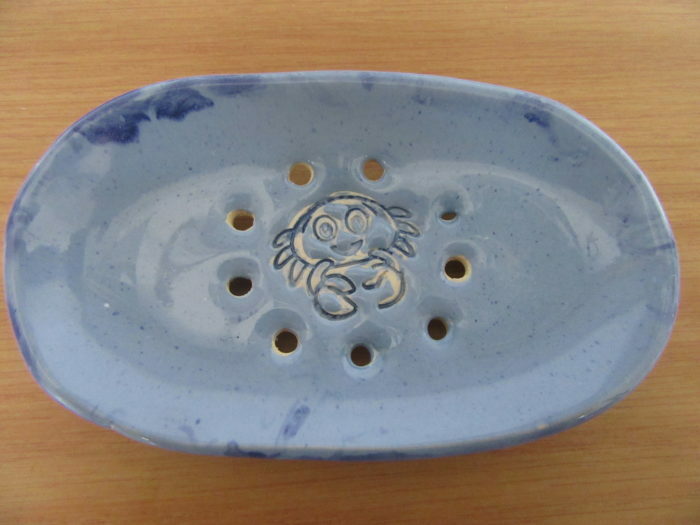 I found that the perfect mould to make soap dishes is the plastic container in which 2 avocado’s are sold. The plastic tray is first coated with a thin layer of Vaseline so as not to stick. For the first sea themed ones I used stamps from a children’s Playdoh set. The clay needs to dry a little for the stamp not to stick to the clay but not too dry that it would crack when pressed with the stamp. I found that a straw was the perfect size to make the holes. When the clay is dry enough to remove from the tray, turn upside down and attach 4 pea sized balls of clay as feet. I then wanted to try carving a pattern in the clay instead of having circular holes. I chose a tree shape to do this. After the bisque firing I painted on copper carbonate and after this was fired on I glazed it using cream stone colour. For the last one I used a leaf, after pressing into the wet clay to get the impression of the veins, the leaf shape was cut out and pressed into the avo tray mould. 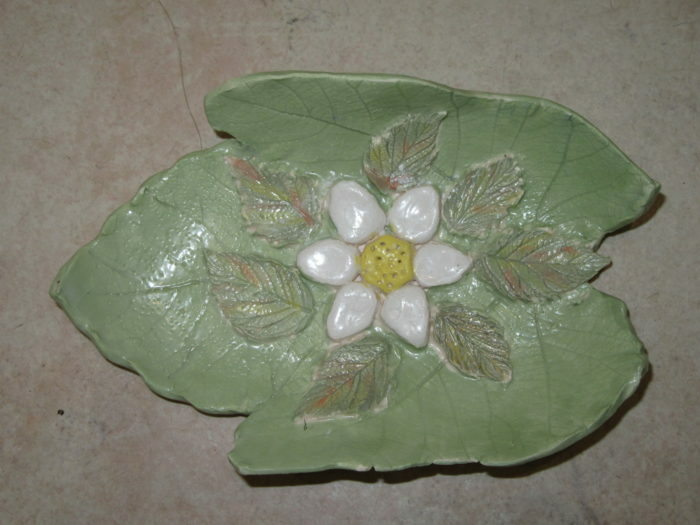 I only peeled off the plant leaf after it was pressed into the mould to avoid finger prints flattening the pattern. I then made a freehand flower and attached it to the wet clay, scratching the joining sides well to ensure that it stuck well. The small leaves surrounding the flower were rolled very thin and again the fresh leaves removed after joining. 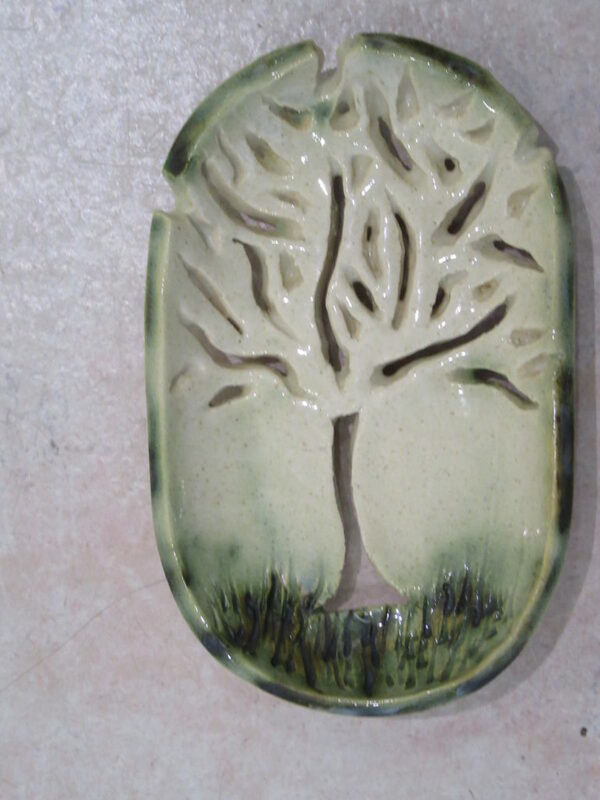 To decorate I painted with under glazes and after bisque firing it was glazed with transparent glaze. This one did not need feet attached as it does not have holes. The bar of soap lies on top of the raised flower and leaves allowing water to drain off. Clever girl. Makes me wish I had not sold my pottery stuff now. Love the tree cut out and the flower one. These are really nice Ursula.